, but with lighter weight, only 55 tons. K2 tank crew to operate 3. Gun caliber 120 mm cannon, two machine guns. 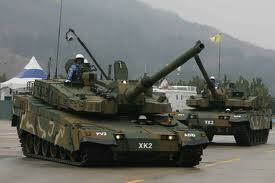 Cruising range of 430 km, with a maximum speed of 70 km / h.
K2 will make North Korea Cavalry think twice before battling head to head with this tank.